I’m sure people wonder why a writer writes. It’s often not for the money, as it’s often tough to make money as a writer (not impossible, and the chances are better today than ever, but still, it can be tough, especially during the first few years to the first decade of professional writing). To be a writer you’ve got to like being alone and using your imagination. Those were two things I enjoyed from a young age, so no problem there. You have to love words and reading – again, no problem, as I was reading at a young age and developed a love for words and books that is still with me. And you’ve got to like to tell stories and get into the world of the characters you write about. That seemed to come second nature to me, so good there as well. In the end though, ask any dedicated and true writer and they’ll often give you an answer like this: I write because I need to. It’s a creative outlet for us, without which we don’t feel as alive. It can even be a spiritual path and experience – I know I’ve felt that way many times. I just think writing is a wonderful thing, as is reading; the two go hand-in-hand. It was a natural progression from my love of reading to try my hand as a writer. I’m so glad I did, as it brings me a lot of joy! I’m also glad that others enjoy reading what I’ve written – I’m ever thankful for my readers and hope you will come along on many more tales and adventures with me! And writing is an adventure for me, too, as I often don’t know where it’s going or how it’s going to turn out until I get to the end. That keeps it entertaining for me as well, so you can’t lose with that! Tip Jar: If you like what I write, you can help me do more of it by clicking on the Paypal Donate button below. Thank you! It’s good to treat yourself sometimes. I’m sure you’ve heard it said it’s good to do something nice for yourself. Sometimes people get so busy that they forget to have fun in life. That’s easy to do. Don’t let in happen to you. Marvel in the everyday miracles all around in nature, take some time out, have a treat, enjoy something in your day, even if only for a few minutes. After all, what are we working so hard for, if not to enjoy life more? It was “unseasonably warm” here today and this evening, but I call it just about right. It was so nice to take a walk and not be in below-freezing temperatures! No need for gloves or a hat! I even took my jacket off! To those of us around here, where it’s been a tough winter, this is something to get excited about! It was about 60F or 15C. I heard it even broke a record today. Fog was in the air, as the light rain and melting snow met the warmer pavement, giving a bit of a spooky look out there tonight. I enjoyed my walk so much that I might go take another one! That’s it for tonight, just a lighthearted post, after some “heavy” subjects in recent days. I knew from a young age that I loved writing, reading, and words. So, it’s no surprise that I followed those interests in my life. I knew early on that I wanted to be a writer. Some people have a hard time figuring out what to do with their lives, and I haven’t really had that problem. I’ve done many things in my life, but it’s always come back to the writing, primarily. Writing was something I did as a child because I enjoyed it. I would often draw pictures to go along with the stories and imaginings. It was fun! I would see my favourite movies, then make up stories about them. Maybe this was early fan fiction? Many of the jobs in my life were directly writing related, and I think this was a natural progression. I find writing comes easy to me, usually, no matter the type of subject matter. I guess you can call it a gift; I certainly think it is, a talent I was given. I wrote before I got paid to do it, and I would still do it if I didn’t get paid. So, you can say I found my vocation and passion. I am grateful for that. I know some people struggle with their purpose in life, and if you are, I would say to follow what Joseph Campbell, author of The Power of Myth series said, and that is to “follow your bliss” and it will lead you to your purpose and passion. The often-said adage/advice: “Go with the flow” sounds good, but how many follow it? I’m in the flow when I write. Time seems to stand still, and I’ve having a great time. There are other experiences in life that produce this effect too, and it’s always nice to find them. Sometimes the flow can be found in regular events in life, and that’s a special gift, I think. It would be great to be able to live your life that way, or at least more parts of it (I’m still working on living it all that way). Tonight I had an experience with going with the flow – or not. I was waiting in line in a chain-type food place, getting something mildly unhealthy to eat (but oh, so tasty! Got to treat yourself sometimes; might be the subject of an upcoming blog post), which I tend to do rarely these days, as I’m making better choices overall on what I eat. It seemed there was only one man working in the store, not just on the counter but getting all the food orders together, too. He said a couple of words to me when I came in, then I watched him run around, putting one item on to cook, then packing up another order, and just rushing around. I was standing there for a few minutes, when he finally came over to take my order, but he wasn’t very clear on things. I asked him some questions, then he ran off again to attend to something beeping! The flow was not going well for me in that place. It didn’t seem like I was going to get good service there, and the menu items they were offering were not at the prices I was looking for, so I was thinking to leave. But where? I was still hungry! Should I just tough it out and be more patient where I was? I noticed there was a competitor’s store across the street, offering the same kind of food, so I called out and excused myself to the busy man (if he even noticed, as he was in the back at the point), and went across the street. The other store was calm, and someone met me at the counter right away. They had the item I wanted, at the price I was looking for, and promptly took my order. I only had a short wait until I got my item, and it was great! So, instead of staying at the first store and trying to put my order in (if I could catch the man at the counter), I was well taken care of in the second store and got better quality food at a better value, plus they had lots of nice condiments the other place didn’t offer. I’m not saying to give up at the slightest sign of a struggle, but it’s good to gauge if you are in the flow or not, and would be better off taking another approach. From my simple experience tonight, the importance of figuring out whether you are in the flow or not was made clear to me once again, as it has been many times in my life. I’ll be sure to be more observant of it next time. It seems to me that life runs in circles. You come around again, to face things you haven’t faced before, then you move on. Well, we move on regardless, but I think we can choose to move forward on the “high road” or on the “low road” – one with more joy or one with more pain. So, which path are you on? It seems Nature likes circles and ovals (and I am spelling Nature with a big N, as I like to give it the respect it deserves). We came from the circle ourselves, when our father’s DNA mated with our mother’s egg. Many spiritual paths talk about this “coming around again” and some even speak about reincarnation as the big wheel of life. So, maybe there is something to it, this circle thing. Perhaps the universe is one big circle, or even a donut shape (don’t mean to make you hungry, there). I have noticed the many circular shapes in Nature, and they make very strong structures. Some people even live in ovals, or dome houses. I think they’re neat and a great idea for many reasons. I’ve been in domes before, and there’s something calming about them; womb-like, even. It can be eerie too, like you are returning to a former, very tiny you inside your mother. What does it mean when people from your past show up in your life again? It could be for many reasons. Sometimes it’s clear that we should open the door to them again, and it feels right. Other times, we wonder if it’s the right thing to do, and if we want to open up our lives to them again or not (they may have been out of our lives for good reasons). But people can change; not everyone, but I have seen many people change so much for the better that they have surprised me. I just take it on a case-by-case basis when I encounter one of these situations. Life and Nature have a way of surprising us, and we often are not aware that another “turn of the wheel” is about to come our way and thrust us once more towards issues we have unresolved. I don’t think we have a choice about that. But we have the choice whether we fall in love with the process of growing and learning, or we shut down and try to block it out. I know which choice I prefer, and I wish you good fortune in your choice of path as well. It’s said that the blank page puts a feeling of dread and horror into writers. This can be true, but only if you have a lack of ideas. I seldom do. I tend to get asked a lot “where do you get your ideas from?” Well, what do you say? I think it’s best to tell them the truth that I don’t really know, but that’s seldom the answer they are looking for, as they don’t seem very excited when I tell them. I consider myself fortunate in that I have many stories I want to tell, enough to keep me busy for many years – and I get ideas for new stories on a regular basis. So the problem becomes what to write first, and how to find the time to do it? The best way I have found is to make steady progress, a little a day if that’s all you can do. It will add up! If you get a chance to go on a bit of a writing binge, that can be good, too. But doing too much at one time is hard to maintain, and I think constant progress is where it’s at, even if the word counts are lower per writing session. This writing observation has been brought to you by the letter Y. Because. This marks the 2nd blog post written in a row that I’m keeping track of as part of my blog “steak” (and for those thinking about running around naked, no). Some writers keep their blog steaks going for years, not missing a post per day (inspiration goes to Dean Wesley Smith). Let’s see how long I can keep mine going! I took a long walk through the wet streets tonight (the snow is thawing here, after a couple of days above the freezing point). There were still a lot of Christmas lights out, reflecting off the remaining snow – magical! Quite a few people were out in the streets, smoking, making phone calls, smoking while making loud phone calls, and just moving about after some very cold and snowy weather has kept many of us cooped up indoors for too long. I like nights like this with the sound of water running into drains and dripping from roofs. It put me in the mood of my D.U.M.B.s series about things hidden underground. Book 7 in the series has been calling me, so those of you waiting for it, don’t worry; it’s on the way! I revamped the look of this site tonight, hope you like it! I also added a Paypal button marked “Donate” as a Tip Jar (can’t tell how to change the wording on that). Tip Jar: If you like what I write, you can help me do more of it. Thank you! Hope for love yet to come. 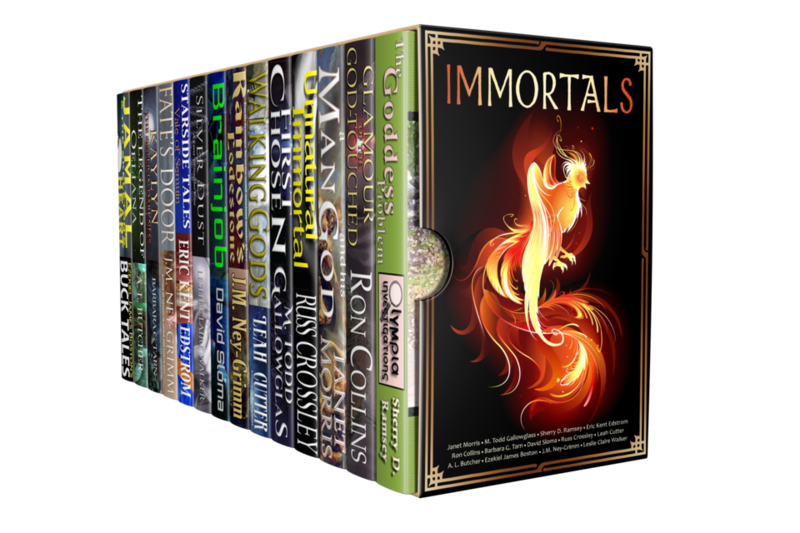 My novel Brainjob is part of the Immortals bundle! Release date: Jan., 31, 2018. Over 2000 pages, for only $4.99 USD!